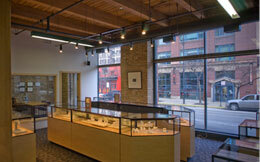 Services - Leber Jeweler Inc.
Leber Jeweler is a full-service jeweler in Chicago’s River North neighborhood. Our 1,700-square-foot retail store provides a serene environment for previewing the complete Earthwise Jewelry® Collection. We have an established lineage of unmatched technical expertise and customer service for three generations.